There are two typewriters that bear the names of popular cars: the Mercedes and the Ford. Neither had anything to do with the motor companies of the same name. 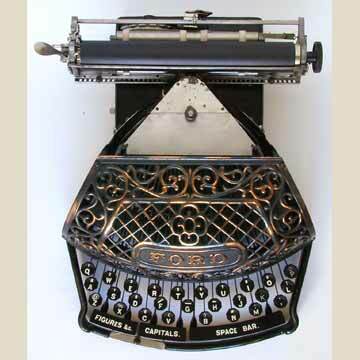 The Ford typewriter was designed by E.A. Ford and introduced in 1895. The Ford is a thrust-action machine, i.e. the type is 'pushed' forward against the platen on hitting a key (pic 2). The machine was produced in iron (as presented here) and completely built of aluminium. The most striking feature of the Ford is its spectacular, ornamental cover. Noteworthy is also the spacebar with integrated figs and caps keys. The Ford was a commercial failure and is very rare. Also see Page 145 of the book â€œTypewriterâ€�.